Born in Tbilisi in present-day Georgia, Solomon Benediktovich Telingater (1903-1969) moved to Baku in present-day Azerbaijan at the age of seven. He was educated at the state-run Narkompros studios of art in Baku from 1919-1920 and at the art and technical school VKhUTEMAS in Moscow from 1920-1921. From 1925 until his death at the age of sixty-three, Telingater worked as a graphic artist, typographer, illustrator, and printer, and is renowned today for his innovations in the fields of typography and book design, for which he was awarded the International Gutenberg Prize in Leipzig in 1963. 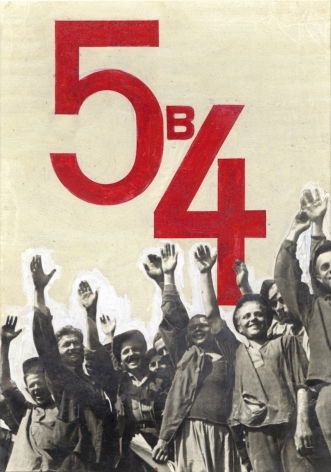 Influenced by Constructivism, Futurism, and Transcaucasian book design, Telingater collaborated closely with El Lissitzky and was an early illustrator of Aleksandr Blok’s controversial poem The Twelve (1918), one of the first pieces of literature written in direct response to the Bolshevik Revolution of 1917. He worked frequently as a designer and typographer for the magazine USSR in Construction, and designed books and produced covers for novelists Maxim Gorky and Nikolai Gogol and poets Semion Kirsanov and A. I. Bezymenskii. In 1927, he was invited to join the editorial board of the journal Poligraficheskoye proizvodstvo (Polygraphic Production). 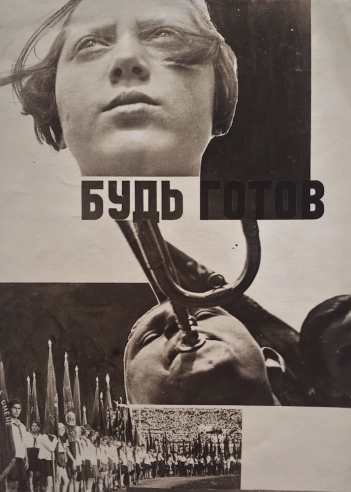 Telingater applied the trends of the emerging film industry in Russia to the fields of typography and design, and was deeply inspired by the montage techniques of his colleagues Sergei Eisenstein and Dziga Vertov. In 1928, in his first independent project, he collaborated with Bezymenskii on a book for the latter’s poem Komsomoliya, and designed the layout and the sequencing to mimic moving picture frames. Writer and graphic designer Steven Heller writes that Telingater “stressed the dymanics of functional typography, and what he called the ‘cinematographicity’ of motion on concurrent pages” (Stylepedia, 2006). Along with El Lissitzky, Gustav Klutsis, and Alexander Rodchenko, Telingater was a founding member of the October Group, a collective of Constructivist artists formed in 1928. In 1932, Telingater and his brother, Adolf, were invited to work for the Theatre of the Red Army in Moscow, and the following year he was appointed artistic editor for Partizdat, the publishing house of the Central Committee of the All-Union Communist Party. In 1934, Telingater and Ilya Feinberg published The Year 1914: A Documentary Pamphlet, a satirical volume commemorating the 20th anniversary of World War I and a masterpiece of Constructivist design, complete with fold-out montages, color photographs, and a dust jacket. In 1935, he designed the seminal Soviet photobook Geroicheskaya Epopeya (The Heroic Epic), which celebrated the famous 1933 Arctic voyage of the SS Chelyuskin. Telingater’s work was exhibited internationally in his lifetime. In 1927, his work was shown at the International Art Book Fair in Leipzig and at the All-Union Polygraphic Exhibition in Moscow, and the following year, his work was shown alongside Klutsis’ in the Soviet Pavilion at the International Press Exhibition (Pressa) in Cologne. In 1931, he participated in the exhibition L’Art du Livre in Paris with Klutsis, Rodchenko, Stepanova, and others. In 1937, at an exhibition in Paris, Partizdat was awarded a gold medal for its advancements in book design under Telingater’s art direction. 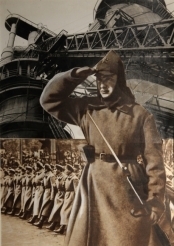 During World War II, Telingater was awarded the Order of the Red Star; the Order of the Patriotic War, First and Second Classes; and four medals for his production of artwork in support of the war effort. In 1943, he joined the communist Party, but was expelled four years later with the rise of anti-Semitism in the Soviet Union. He avoided arrest, but was left with little work. In 1957, he was selected to redesign the cover and layout of Iskusstvo kino (Cinema Art) for a major overhaul of the journal, and the following year he designed the publication Moscow: Planning and Construction in the City, 1945-57. Solomon Telingater died of a stroke in Moscow in 1969, at the age of sixty-six, having designed more than six hundred books in his lifetime.